It's SNOWING! Where is the snow plow? Will the city plow my street? The map below is just our neighborhood area, you can see the entire map HERE. Red streets are plowed, blue streets are sanded. Please review this snow plow route FAQ and review the map to see which streets will receive treatment, and why they are the roadways selected. In the event of a winter storm, which streets will city crews plow? The City’s streets crew will plow the City’s primary arterial and collector streets in an effort to keep them safe and passable. The goal is to help our residents get to and from their places of business and to keep the City’s primary roads open to emergency response equipment. Due to limits of City resources and staffing levels, snow plowing will be limited to this route. What are residents responsible for when it comes to snow removal? To aid the effort the City asks that vehicles along the route be parked off of the right of way to avoid possible damage from plowing the snow to the edge of the roadway. Property owners are responsible for removing any snow that might pile up in front of driveway approaches and on sidewalks from the plowing. If you have any questions, please call the Public Works Department at (503) 786-7600. 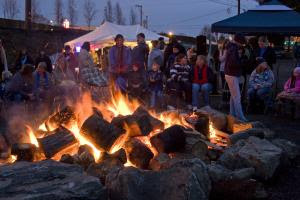 Upcoming City events: Paul Klein visited to invite everyone to the Winter Solstice and Christmas Ships event on Saturday December 17th, about dusk at the Riverfront park. There will be a beer garden this year, and sales of hot chocolate, pie and hot dogs will support Lewelling NDA. Also, the Milwaukie Museum will have an Open House on Saturday December 17th from 1-5pm with photo opportunities with a Christmas Elf. The Museum is located at 37th and Adams. Public Safety Captain Dave Rash attended and reported that the department is interviewing for a new officer right now and is performing background checks on a new administrative assistant for the Chief. A number of questions were asked about various code compliance issues. He reminded everyone that if someone sees something that concerns them they can either call the non-emergency dispatch number 503-786-7500 or of course 9-1-1 if something is going on right now. Don’t hesitate to call right away if something concerns you or doesn’t seem right. He reported that Officer Simac is the police officer of the year and cadet Colton Anderson was voted by his peers as cadet of the year. The Officer of the Year dinner will be March 14th at the Milwaukie Elks. Heather Ray reported that there are a lot of changes going on right now and there wasn’t a quorum for their last meeting. Several positions need to be replaced. She said as far as she knows the SAFE program, which will help pay for new sidewalks and creating safer walking zone is going forward in January, with $4.30 assessed to each residential unit per month on the water bill. City Staff: Friday Memo is being sent via Email each week. Past Meeting Minutes and Treasurer’s Report: Linda Hedges asked if there were any corrections or additions to the November meeting minutes. There were none. Approved by consensus. She reported that the financial account was CCG $1398.25, $1000 committed to the park bench project; checking $1304.84; savings $5004.55. Milwaukie Museum requested $200 toward the replacement of their furnace. Steve Rand moved and Wally Bischof seconded motion, approved unanimously with one abstention (Aschenbrenner). We also voted to pay for one year’s membership fee of $100, Mary Weaver moved and Sarah Smith seconded. Unanimous with one abstention (Aschenbrenner). Milwaukie HS and MAA Graduation Party request for $500 was moved by Sarah Smith and seconded by Susanne Richter, on the condition of their participating in a work party valuing $500 in work hours at $15 per person hour. $500 grant was approved unanimously on condition. Sarah Smith moved and Mary Weaver seconded to appoint Ley Garnett to the Hector Campbell Land Use Committee. The motion was approved unanimously. Ley will attend to the appeal process on behalf of the NDA and if possible, Lars Campbell, the Chair of the Land Use Committee, will also participate. Dieringer Properties has requested an adjustment of zoning for their property on 44th and Llewellyn so that they can build a new 4 plex and 2 plex. Lot size adjusted from R3 to R2.5. Chair Aschenbrenner and Sarah Smith met and discussed their application and will recommend approval. Parks & Garden Report: Sarah Smith reported the Garden has started the installation of a 225 gallon rainwater harvesting tank. She thinks there will be a donation of the tank. Plots are available in the garden for $30 or $40.She estimated between 1250 and 1300 lbs. 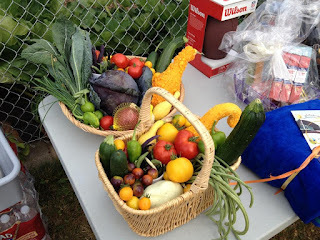 of produce were donated to Esther’s Pantry this year. The new sponsor for 2017 is Renee’s GardenSeeds. The Parks district is considering removing a few cherry trees on the south side of Homewood Park. There are plans to plant native plants in the winter. Mary Weaver asked about the health of the large tree located on Home Avenue in front of the park. Sarah will ask the Parks District to check on whether it is healthy enough to remain. Monroe Greenway County hearing – Bernie Stout attended the November 15th meeting at Clackamas County. The County has denied funding at this time. Bernie will follow up with City of Milwaukie on this project. Vice Chair position: Lars Campbell, who has served the NDA for several years, plans to move soon. We will be considering candidates for the position at our January meeting. The Vice Chair serves as the NDA’s Chairman of the Land Use Committee and runs NDA meetings in the absence of the Chair. S/he undertakes other tasks as requested by the Chair or at the request of the NDA. The evening concluded with holiday goodies and door prizes. Neighbors please join us Monday evening for our monthly meeting plus special treats and door prizes. Public Safety Chief Bartol attended and reminded neighbors that this time of year, when packages are being delivered and thieves are out and about, to arrange for packages to be delivered to work addresses or to neighbors or to arrange for delivery at specific times. Lock your vehicles and don’t leave anything of value in the car. A number of questions were asked, including about street parking and registration for the CodeRed (reverse 9-1-1) program. Discussed various code compliance issues. A neighbor pointed out the very dangerous 37th and International Way intersection. The Chief suggested that if someone sees something that concerns them they can either call the non-emergency dispatch number 503-786-7500 or of course 9-1-1 if something is going on right now. Heather Ray volunteered. Sarah Smith moved and Brian Bell seconded to elect Heather to represent our NDA. She was elected unanimously. Another neighbor, Rebeccah Bufford, was also interested. She was encouraged to apply for one of the at-large positions. Past Meeting Minutes and Treasurer’s Report: Linda Hedges asked if there were any corrections or additions to the October meeting minutes. There were none. She reported that the financial account was CCG $1633.73; checking $201.55; savings $7004.55. Milwaukie Public Safety Foundation – Police Officer of the Year Award Dinner. Darlene Albertson moved and Wally Bischoff seconded $300 grant. Approved unanimously. Wichita Center – holiday support grant. Heather Ray moved and Sarah Smith seconded a $300 grant. Approved unanimously. Lynn Sharp, a member of the Board, attended to report on the projects the Board has been working on this year. 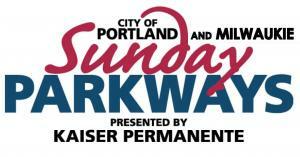 a) Milwaukie Historical Society has submitted a proposal to change the name of Riverfront Park to Milwaukie Bay Park. This request is finding its way through the process. Milwaukie Bay is the historical name for the part of the river fronted by the park. b) Wichita Park received funding to complete the planning process. The source of the $250,000 needed to build the park has not been identified. c) New trails have been built at Spring Park which reduce the impact there and increasing safety. d) A $1.2 million grant has been received for engineering/permitting and bidding for the trail that will lead from the light rail pedestrian bridge through the park to the light at River Road. e) The new Tree Ordinance for public property, including the right of way is in effect. Three of the four requirements for Tree City USA status have now been satisfied and the city is currently working on documenting the $2 per capita spending on trees last year. f) The beginning of an annual Arbor Day celebration was held this year. g) The PARB is working with city staff to create a 501©3 to create a Milwaukie Parks Foundation so funds can be donated for parks projects. h) The Park Board looks for public input on park and recreation issues. The Park Board meets the fourth Tuesday of the month. There is currently one position open. http://www.milwaukieoregon.gov/communityservices/park-and-recreation-board. Contact Lynn Sharp at lynn-sharp@outlook.com. Bench Project – Linda reported that we’re still waiting for the local company to provide the project quote and invoice. The School District has approved the installation and location of the bench. Parks & Garden Report: Sarah Smith reported the Garden has started the installation of a 225 gallon rainwater harvesting tank. She thanked Brian Bell for hauling and helping to spread gravel. The Parks District operated an ivy pulling evet on Saturday Oct 29th 9-noon; 600 lbs of ivy was pulled. Plots are available in the garden for $30 or $40. Gardeners have requested a porta potty be made available. See below disc golf discussion; a porta potty might be included in that project. The Little Library needs to be reconstructed. It had an ant invasion. Bernie Stout and Brian Bell have volunteered labor and materials. There was discussion of including a seed library as well. Sarah mentioned a Nike community grant that encourages community active living that we may want to pursue next year. In particular we may want to see if a disc golf course could be installed in the upper field of the school. If anyone has an interest in working on this please contact Sarah. The Parks district is considering removing a few cherry trees on the south side of Homewood Park. There are plans to plant native plants in the winter. Vice Chair position: Lars Campbell, who has served the NDA for several years, plans to move soon. We will be considering candidates for the position at our December meeting. The Vice Chair serves as the NDA’s Chairman of the Land Use Committee and runs NDA meetings in the absence of the Chair. S/he undertakes other tasks as requested by the Chair or at the request of the NDA. City Manager Ann Ober attended to introduce herself to the neighbors. She and her family will be living in our neighborhood. Boil Water Notice and Disaster Preparedness: Linda Hedges reminded neighbors about planning ahead to have water on hand along with other water, food and survival supplies for at least two weeks. A water contamination issue is just one of the reasons why everyone should make preparations for at least two weeks. She displayed a water filtration system as an example of one way to assure clean drinking water, but many are on the market. As well ¼ tsp of bleach per gallon of water also disinfects water for drinking. Please pass this information on to your neighbors. Umbrella Parade and Christmas tree lighting in Downtown Milwaukie. Everyone is invited to decorate an umbrella and parade through downtown to City Hall for a visit from Santa and the Christmas tree lighting. Visit the Cities website for all of the details. 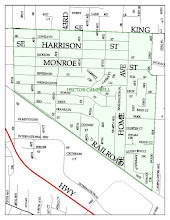 Operation Santa Claus will be in the Hector Campbell Neighborhood see the rout map here. Fire district personnel and volunteers will lead Santa's fire truck through the neighborhood collecting new un-wrapped toys and non-perishable food for food boxes. To learn more about Operation Santa Claus go to the Fire Districts website. Monthly Neighborhood meeting at the Public Safety Building. We will have special holiday treats. Join us and learn what's happening in our neighborhood. Neighborhood Picnic, time to RSVP! Please RSVP if you plan to attend our eighth annual neighborhood picnic! Neighbors, you are invited to our eighth annual neighborhood picnic! It is FREE to residents and business owners in the Hector Campbell Neighborhood, all you need to do is RSVP. Please invite your next door neighbor to attend too! Monday August 8th, 6pm to 8pm on the upper field of Campbell Elementary School, next to the community garden. If you are planning on attending our picnic, PLEASE click here to RSVP. Or call: 503-683-1826. Those who RSVP and attend, will be entered in a drawing for door prizes! Please RSVP by Saturday August 6th. 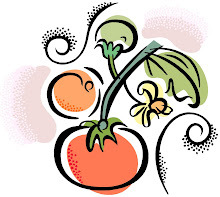 We will be serving hot dogs, salads and veggies from the community garden. Our neighborhood is in the process of designing a new logo to be used on this website, letterhead, magnet and other marketing material. We sent a request to our neighborhood email list for ideas for a "tag line" to include with our. We are now asking our neighborhood to vote on their favorite one. 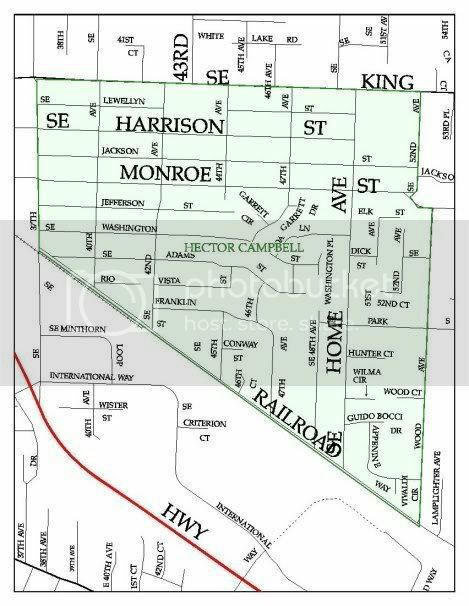 Please select the one that you best think represents the Hector Campbell Neighborhood on the poll located on the right sidebar of this web page. NOTE: Mobile device users will not see the poll until you scroll down the page and click on the "View Web Version" link. Choose your favorite right now, as this poll will close at the end of the weekend! Thanks in advance for participating! Save the date for the 8th annual neighborhood picnic! Monday August 8th 6 -8 PM next to the community garden. NOTE: we do not have our regular meeting in August. Check back here and watch your mail for a request for RSVP's. Hot Dog, Salads, Italian Sodas, Face Painting, Meet your neighbors! Save the date for this family friendly event!